Going back before my previous in character adventures, seeing if I can draw together some sort of plot. love it/hate it/publish it. A light flashed on his console. The light went out. Another light started blinking. A green light on the left of his console started blinking. The lights went out, and his console went black, signaling the end of his shift. Sighing, John was about to stand up when a message flashed on his console, with an unknown sender. John stared at the message for a second before turning to the man seated at his left, who was currently trying and failing to contain a grin. “Jake, you almost got me that time”, said John, a matching grin on his face. “Heh, man, I had you completely fooled and you know it” replied Jack, the grin now completely overtaking his face. Laughing, the two friends walked off to their apartment complex, their shifts for the day finally over. At their apartment, Jake flopped onto the mutual couch while John sat down at his terminal. His roommate’s muffled voice floated over. Well, in our homely C5, we haven’t had a grav site in days, Blake recently obtained his carrier certification, ship and matching fuzzy dice(Or whatever pod pilots hang on their capsules. Ship nuts? ), and we have a Static C6 connection. If there’s another sign from the random lords of the universe that we should move into a C6, I can’t fathom it. The original WH goers, R-man and B-dude, inhabited a c2, moved to a c4, moved to a c5, then I joined. We three moved from that C5 to another C5, where Carrier bounce dude joined us. Another C5, two more miners joined us and the carrier went 4800m/s over its designates speed before colliding with a warp bubble. The ex-carrier pilot left the WH, leaving us with six people, eleven total including alts. Combat wise… we’ve got a BC pilot, an apoch miner just now training gun skills, a tech two amazing domi, a tech 1 fit domi(me), a competent minmatar BS flyer, and a carrier pilot(assuming we manage to get blake into the WH before he’s DD oneshotted. I’ve never been to a sleeper site in a C6, but could someone here, say, a C6 inhabiter, tell me how much firepowa we should have before attempting to move to a C6? Also, the carrier pilot said that it was an incredibly stupid idea and that we didn’t have the manpower. Also, I’d really appreciate if someone could clarify for me if a buffer fit or active fit is better for running sleeper sites w/ a spider rep gang. I’m not saying that it’s pretty demoralizing to watch someone gain a sliver of health per cycle with two large RRs and 5 heavy armor maintenance drones on him, but it is. Also, I’m looking at a 65 inch TV on criegslist that’s broken. Anyone know what “It turns on fine, but only lasts a few seconds” could be? Also, a friend introduced me to The Interruptor. Friggin hillarious. I’ve done it before so why should I be nervous? I’ve crawled my way up from a frigate class ship into a Battleship and have commanded my Dominix in many successful Sleeper encounters. Going into Capital ships is just another logical step, right? Not to me. The ships are big, the modules are expensive, and the entertainment value is high. After 1.5 years of playing Eve, I am entering a time when I am stepping into an entirely new philosophy of ships – Capital ships – massive, slow to align, Oxygen Isotope consuming behemoths. 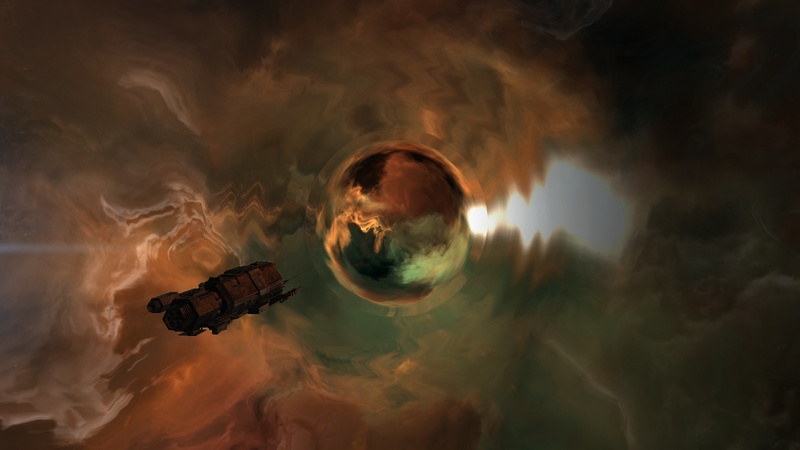 Some have big guns, some repair things at great distances, some huge Cruiser sized drones, and some crush a hangars worth of ore down into an Iteron V.
I’m sure you have faced the “what am I going to do with my character now” point in your Eve career. Invention wasn’t calling out to me, I can already produce with Material and Production Efficiency V, I have good Dominix skills, so maybe now is the time where I should go play with the big boys in Capital ships. 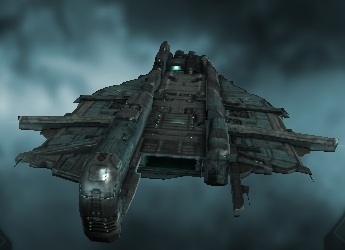 I picked up my Thanatos, the Agamemnon I, in the Lonetrek region on a contract for 700M. It is currently docked in station awaiting the completion of a few more skills before I bring it into WH space. First and foremost, a Carrier is a support ship. It is not a tackler or a DPS ship. Its main role is to repair your DPS, electronic attack, tacklers, or other capital ships. A Carrier is not a toy to be bounced off of large asteroids (!). You can be prevented from jumping by a single warp scram. Items that you put in the corporate hangars can’t be scanned by a cargo scanner. Use it to kill Sleeper Battleships and support your mates at Gravimetric and Ladar sites. Note that warping a Capital ship to a Mag or other encounter site will trigger 5x additional Sleeper spawns (yikes). Keep it at the POS as a show of force. 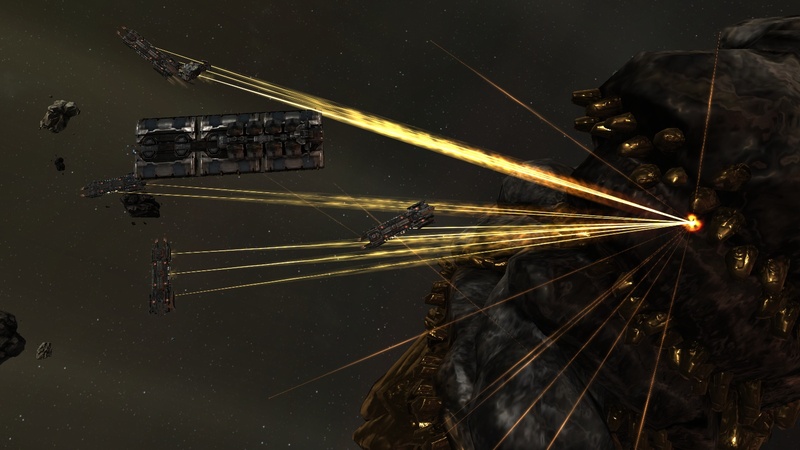 If you were not very aggressive and saw a few Battleships, a Carrier, a Rorqual and lots of POS modules, would you continue to scan or move on to the next WH system? 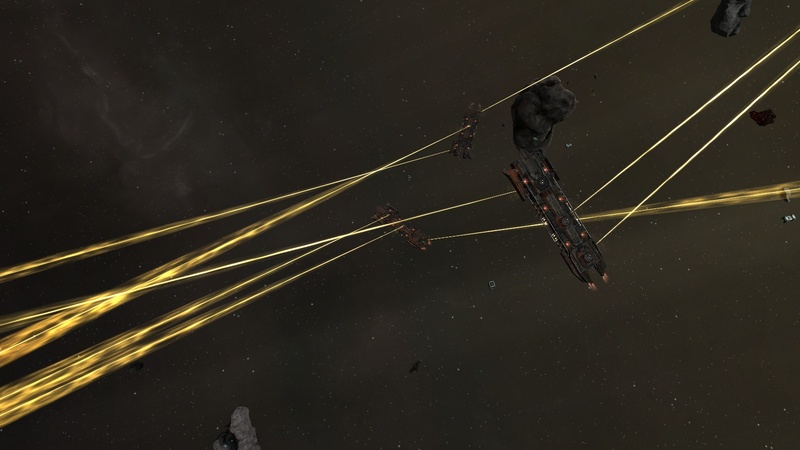 Conversely, if you were an aggressor and saw such juicy targets as a few Battleships, a Carrier, a Rorqual and lots of POS modules, would you camp the system and hunt us down? Haul ships and modules when relocating to a new WH. A POS in WH space is like a campfire while out on a long nature adventure; you setup camp, do some activities, put the fire out and move on. After you anchor a POS in your system, the site respawn rate drops significantly. Moving ships one by one is a pain so putting a few ships in the Carrier will drastically lower relocation time. Close those pesky WHs as not all WHs are welcome. 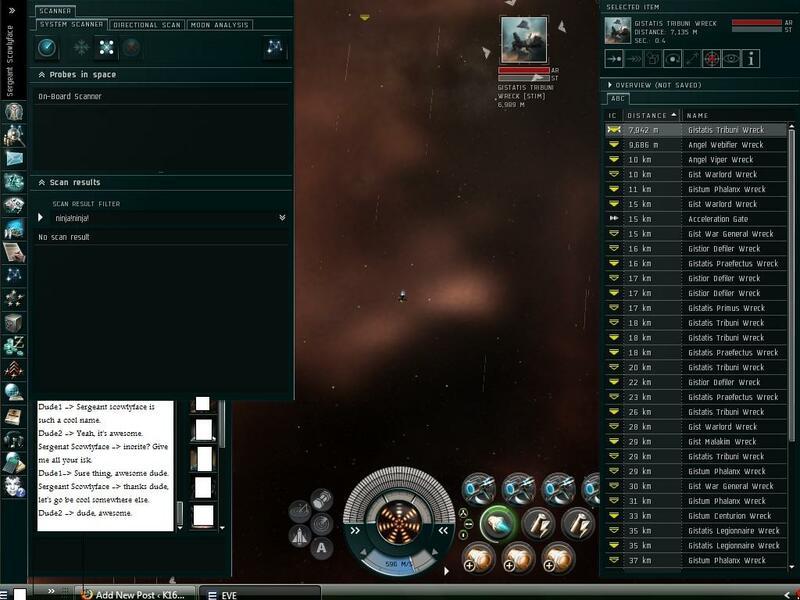 Sometimes you get a hot nullsec WH that everyone wants to come have a peek in your system. A jump with an Orca and Capital ship will close that right up. Sounds like fun, aye? Hopefully you might run into me someday in WH space launching some Bouncer II’s or closing a WH. December was a month of mining for my corp. We cleared a few core sites on WH space that netted me around 750M. I’ll be stepping into a Thanatos soon, so there will be a lot of Carrier pictures coming in January. I’ll try to make this a monthly feature. 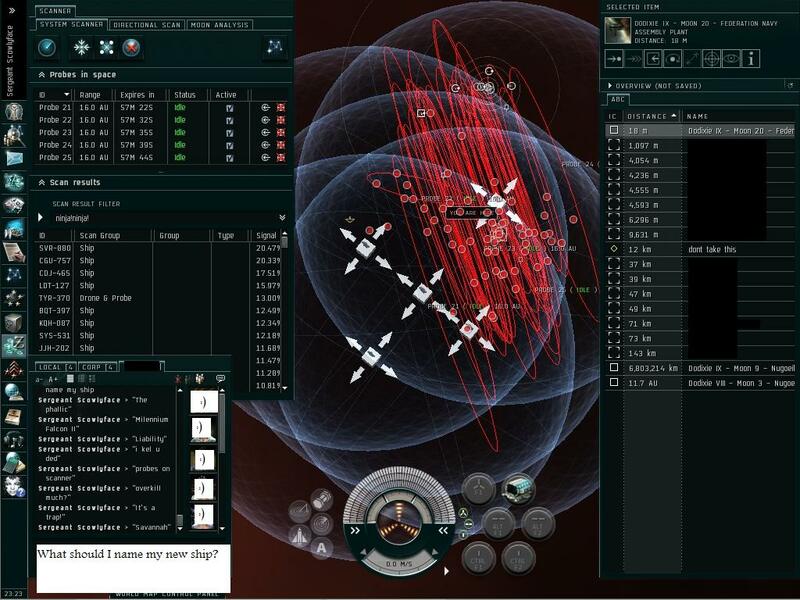 Well, xxDeath came into our WH again with covops and stealth bombers (this makes the third time), since we again have a nullsec connection to their space. 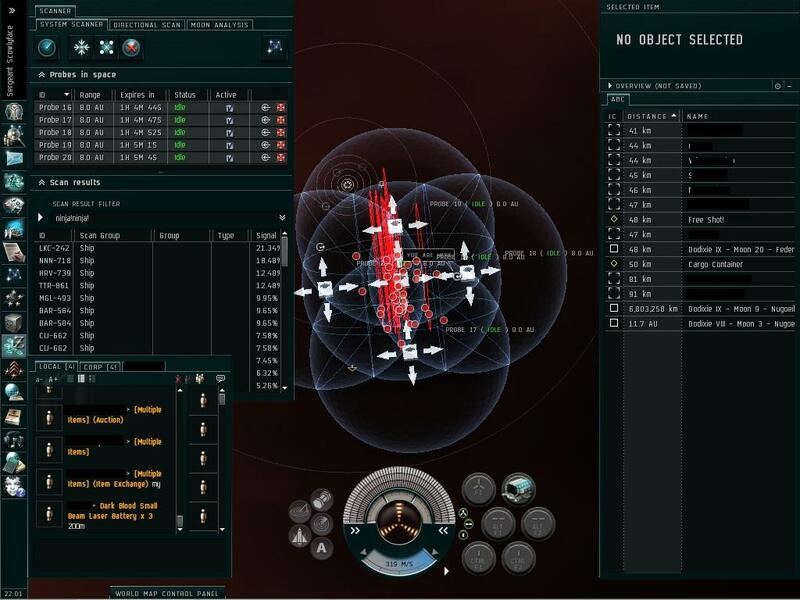 It seems odd that we keep finding nullsec connections, and odder that every other connection is within 5 jumps of xxdeath territory. So, since there was no way in hell I was taking my 190 mil hulk out w/ dudes on the loose, I went to my alts. Sergeant Scowlyface, the salvager alt, has completed his salvage training. (tech 2 afterburners, MWDs, salvagers, and destroyers). Unfortunately, morleena, my combat alt, had her skill training put on hold once I realized that my current Orca skills on herleena, another alt on the same account, gave me a grand total of 2 seconds off my cycle time. So, I’m training mining director to IV and picking up the warfare linking skillbook once we get an enterence. Anyway, having a salvager in Dodixie, I asked politely in local if anyone needed their missions salvaged. After the missions runners and mission ninjas alike laughed at me, I started training astrometrics to learn about this ninja salvaging hoo-haa. Three hours later, I undocked with basic combat probes and an expanded launcher only to have a covops frigate explode directly in front of me. Looting the wreck and docking immediately was exhilarating, and netted me a sister expanded probe launcher and five sister combat probes, among other things that I couldn’t use. During the 15 minute wait time while the victim moaned about losing his ship and the killer moaned about losing the wreck and the pod, I fitted the scanner and probes to my imicus and watched a short video. Undocking, I warped to a safespot and launched probes, hit scan, and waited to see ships I could warp to. Fifteen seconds later, the scanner gave me…no results at all. Rechecking the video, I was told to set my filter to battleships and command ships. So, I set my overview to just command ships and battleships. After a few more minutes of cursing, I asked in local for help and learned that I was supposed to set my scan filter, not my overview filter, to battleships and command ships. This done, I scanned down a Rattlesnake, got into my Catalyst, and warped to him. I found myself at a warp gate, and went through. I found myself in a sea of yellow wrecks, and proceeded to salvage my heart out. By the tenth wreck, I was already irritated at how slow my catalyst was, so I docked, buying a tristan at the station I was docking in, along with three small salvage tackles, 3 overdrive injectors, an 1mn AB II, and two cap rechargers: total fitting cost: 6mil. Total ship cost: 200k. I warped back to the gate to find the gate gone, so I redocked, got my imicus, and scanned a new dude down. BMed, warped to w/ tristan. The mission was Worlds Collide, and after I salvaged the initial room, I went to the second room and began salvaging. Four wrecks later, a catalyst shows up and begins salvaging the wrecks. I immidiatley angle towards the wreck he’s tractoring, lock it, and arc past, salvaging it before he can. I was immidiatley awash with the feeling of out-manuvering someone with an extreme tactical advantage, and proceded to out-salvage him for the next five wrecks before leaving to help close some WHs in our home. So, ninja salvaging. So easy, less than one mil SP chars can do it, assuming they know how to work the scanner and an afterburner. Not very profitable by WH standards (400 mil paycheck yesterday), but extremley profitable from a dude flying in a navitas’s standpoint. The moral standard in Eve is somewhere below a toilet in a sewer in the mob-run part of Detroit, so don’t expect anything you don’t nail down to still be there in the morning. At heart, ninja salvaging is a pretty tame moral deviation, since half the time the runners don’t even care about the salvage and the other half, they’re so sick of ninja salvagers that they made a salvage alt. So, if I find a bunch of unattended wrecks, I’ll assume that they’re fair game. No-one take me up on this, but it seems to me that if a jerk in a destroyer can kill a hulk, he should be able to kill a frigate before getting concorded. If people are really annoyed by salvagers, then using a destroyer to suicide gank them and getting paid, then using the salvage the ninja salvaged to pay for a new destroyer, seems like a niche someone could fill pretty easily. No-one do that tho. It’s stressful enough when a BS rat starts shooting at my tankless frigate, someone in an anti-frigate ship shooting at me will ruin my whole day. Fly safe, as I probe you. P.S. I’ve decided to name my third char on my main account “Indigo Montoya”, but have no idea what to have him do. My main is gallente BS and miner, I have a salvage alt and can’t think of a third role I want to pay right now. I won’t lie; I’m a work-shy freeloader when it comes to scanning. Usually, by the time I sleep through my alarm, eat breakfast, take a shower and get around to logging on, there’s either a grav to hit or a WH to haul ore through for the next paycheck. Unfortunately, I can get dedicated to the tiniest things, and my brain won’t shut off till the task is complete. This is why it’s currently… four in the morning and I’m still trying to scan a highsec exit. So, scan tips. An important think to remember in wormholes is that there are two types of wormholes: incoming and outgoing. Or, as I like to call them, “someone’s found us” and “we found another empty neighbor”. Most WHs will have a static type, which means that at any given time if you start scanning that WH you will always find a WH of the given type, for example, a c6. Since the WH we currently reside in has a static C6, this makes scanning a route to highsec all kinds of fun and laughs, when you consider that C6s are the deepest you will go into WH space and are therefore have the lowest chance of a nice highsec to cart 400,000 m3 of ore out of. 2. Don’t forget to BM the WH before you do anything else. 3. Open your scanner, go to the directional tab.Turn off active overview settings and press scan. If you don’t see scan probes, PoSes, pos guns, ships, or anything that looks threatening, proceed to step 4. If not, inform your corp mates, and proceed to step four carefully. 4. Launch four probes, then move 15km away from the WH. 6. Set one of the probes to 32 AU and move it to the center of the system. If the probe does not encompass the entire system, set all the probes to 32 AU and do the best you can. 7. Press “Scan”, wait 5-10 seconds, then look at the signatures that result. Whine to your corp about how many signatures there are (if over 15) or how unlikely a highsec exit is (if lower than 15). 8. Choose a signature at random. 9. Set your probes to one size bigger than the sig..sphere. If the sig is a red dot, set the probes to 8 AU. 10. Move your probes into a 2D diamond shape, and move as group (shift-click) so that the four circles form some sort of weird shape covering the circle completely. Hit scan again. 11. If the signature disapeared, and there are no other signatures, make your probes one size bigger and scan again. If there are other signatures, go back to step 9 for that sig. 12. If there are now two signatures of the same name, curse quietly to yourself. Move your group of probes slightly up or down so that only one sig is encompassed. Rescan. if the sig vanished, move the group over where the other sig used to be. If that sig vanished as well, curse a bit louder, increase probes by a size and scan again, going back to step 9. 13. If the sig formed a 2d circle: Curse again. Make the probes one size bigger, encompass the circle, and scan again. Go to step 9. 14. If the sig formed a red dot: Silently cheer to yourself. Go to step 17. “Bitchin Crokite” is not informative. “Excep. core Crokite” is. “I hate scanning” is not informative. “Static C6” is. 17. Reduce your probes by one size and adjust them to keep forming the diamond around the dot. Press scan again and go to step 9. 18. Fake a disconnect so you don’t have to help scan another damn c6 w/ 30 sigs in it. Well, another Christmas come and soon to be gone; with all the anticipation felt over the last month replaced by the complacency of having to wait another year. Our WHers already got our christmas gift from CCP, with a new exceptional core opened with another 150k crokite with only one sleeper BS, so we’ve been busy. Ironically, we’ve got something like 300 units of compressed ABC and haven’t been able to find an exit remotely close to highsec. Personally, I blame the new WH and its static C6, but then again, this WH also has 80% bonus to remote reps and capacitor recharge, so I’m not complaining. As much as I usually would. Christmas presents are all wrapped, and given to close friends and family; far friends and family still a problem tho; ironic in this information age of instantaneous conversations. So, in closing, fly safe all of you, especially my family far away, my friends far away, in Eve and not, who probably don’t want their names mentioned, or maybe do, I’ve sworn off Eve for christmas eve and day for family time.